Shampoo & conditioner at the touch of a button! Shower clutter and mess are history when our Corner Trio Dispenser is on the job. This attractive looking unit offers push button convenience for shampoo, conditioner, shower gel or lotions. The liquids are stored in 14 oz. refillable chambers. With one or two strokes of the pump, just the right amount of shampoo, conditioner, soap, lotion or shower gel is dispensed. The AVIVA TRIO Dispenser allows you to buy your favorite liquids in bulk to save money and reduce plastic consumption, which in turn will reduce the impact of all those empty plastic bottles in our landfill sites. The most unique and brilliant feature of this model is that it can be installed either on a flat wall or neatly in the Corner! Includes waterproof labels and installs in minutes without tools using silicone and two way tape (included). Easy to fill and dispense. 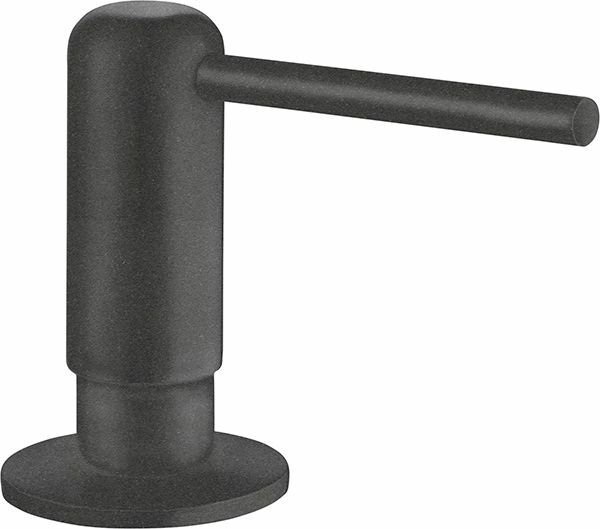 Femme Soap Dispenser, Cinder BLANCO soap dispensers are made of solid brass construction for exceptional durability and can be used to dispense liquid dishwashing/hand soap, and even hand lotion.